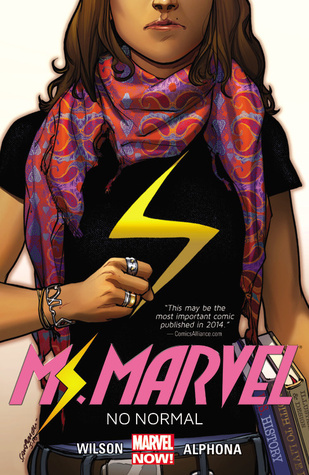 Marvel Comics presents the new Ms. Marvel, the groundbreaking heroine that has become an international sensation! Kamala Khan is an ordinary girl from Jersey City — until she's suddenly empowered with extraordinary gifts. But who truly is the new Ms. Marvel? Teenager? Muslim? Inhuman? Find out as she takes the Marvel Universe by storm! When Kamala discovers the dangers of her newfound powers, she unlocks a secret behind them, as well. Is Kamala ready to wield these immense new gifts? Or will the weight of the legacy before her be too much to bear? Kamala has no idea, either. But she's comin' for you, Jersey! It's history in the making from acclaimed writer G. Willow Wilson (Air, Cairo) and beloved artist Adrian Alphona (RUNAWAYS)! Collecting MS. MARVEL (2014) #1-5 and material from ALL-NEW MARVEL NOW! POINT ONE #1.